2. Blanche the spinach in boiling water for 1 minute. Rinse in cold water to stop overcooking. 3. Add a teaspoon of sesame oil and mix it up. Season with salt. Set aside with the rest of the filling ingredients. 4. Place bamboo mat on the cutting board. 5. 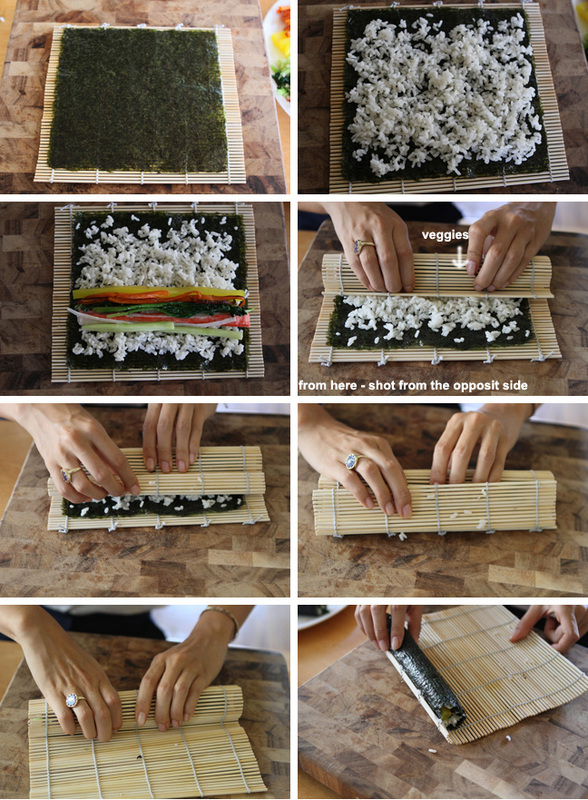 Place a sheet of seaweed on the roll. 6. Use a spatula and spread a thin layer of rice on the seaweed. Leave aninch on the top and bottom end empty, with the exception of a few grains. 7. Place the filling ingredients on the bottom third of the rice. 8. Carefully bring the bottom part of the bamboo and bring the seaweed over the ingredients and tuck it in to start the roll. 9. Move the bamboo back and and make another half roll. Press firmly and carefully with each half roll. 10. Repeat until you reach the end. The few grains of rice will keep the roll closed. 11. Roll the seaweed roll in the bamboo and press a little to make a nice round shape. 12. Brush some sesame oil on the roll. Sprinkle sesame seeds. 13. Cut into slices with a sharp knife. I need to learn to make it. Just wondering what kind of rice you would recommend using? Japanese sushi rice or korean style rice? i love this dish! and would love to make? we used korean rice but japanese sushi rice work too. That looks delicious. Love this stuff, especially the spicy tuna one. I really love this space you have here...great addition! Hi Jeana, question for you! I had a roommate in college whose Korean aunt would send her delicious homecooked food in big packages, one of which became my absolute favorite food ever! Ever since, I've been trying to learn to make it. According to my roommate, it's called "Moo mal-eng-hee", and it contains "sliced dried white radish seasoned with soy sauce, honey and red pepper flakes" and lots of basil leaves. Does this ring any bells? I want so much to learn to cook it, and my Googling has been fruitless! Love the pictures and step by step explanations! I also love that dish. The radish pieces are strung onto string and dried in the sun. Then marinated with the ingredients you mentioned. Maybe we will do that one in the future! Thanks for answering, Bo! I really hope you cover it, it's been a mystery to me for years! I love this blog! When I make these veggie rolls, I place the bamboo mat in a zipper closure plastic bag. That way I can make several rolls and my bamboo sheet always stays clean. Thanks for the great recipes! Thank you ! Great place for the roommates to come look for cooking ideas !! !